The Sustainable Settlements Facility (SSF) was a concept designed to meet the challenge of financing low-income, social and “gap” housing (fully and/or partially government-funded housing units) with the need to achieve low-carbon and climate-resilience in South Africa. The SSF emerged as a concept from the lessons of the Kuyasa Clean Development Mechanism (CDM) Pilot Project in Khayelitsha (South Africa). The Kuyasa CDM Project addressing methodological design issues related to the generation of certified emission reductions (CERs) from housing projects of a similar nature. SSF was mentioned in the South African National Climate Change Response White Paper (October 2011) as a potential financing mechanism for one of the listed Flagship Programmes. The SSF was envisaged to play a critical financial and technical assistance role within a broader national climate change response and assist with the enhanced delivery of South Africa’s provision of public housing. The establishment of the SSF was a project partnership between SouthSouthNorth (SSN) and the Development Bank of Southern Africa (DBSA) with funding from KfW and the Federal Republic of Germany. In addition, during 2012, the British High Commission in South Africa provided a grant to support a stakeholder engagement process with a view to map stakeholder roles and focus the SSF’s overall purpose and implementation plan going forward. The decline of the value of the CER market in response to sunset of key international agreements underminded conceptual financial viability of the SSF. As a result, the project looked to position the SSF as a Nationally Appropriate Mitigation Action for South Africa. A NAMA concept was drafted but, to date, has yet to be taken into a full proposal for the South African Government. Subsquent to this project’s conclusion, there has been progress in the improvement of energy and thermal efficiency in government- subsidised housing in South Africa. 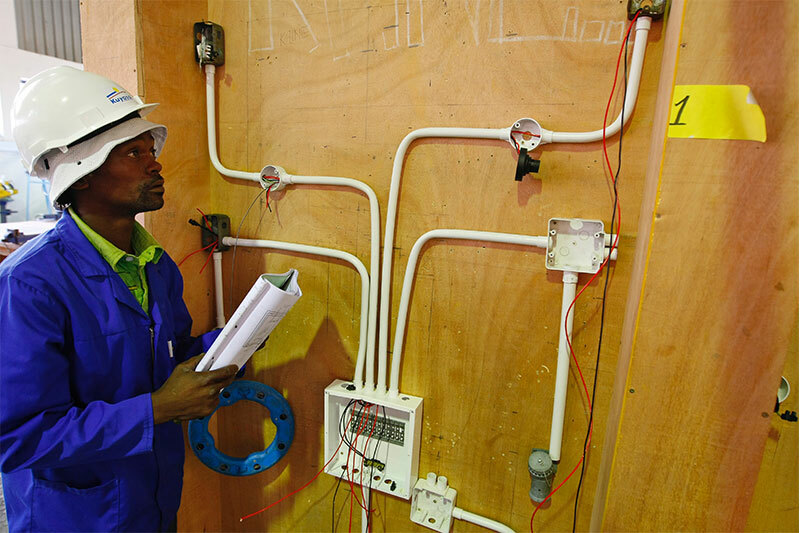 Furthermore, independently of the project team, a Energy Efficiency in Public Buildings and Infrastructure Programme (EEPBIP) has been proposed as a South African NAMA. In South Africa there are approximately 1.2 million households located in 2700 informal settlements. The existing stock of low-income housing is considered inadequate in terms of the poor quality of building structures and the provision of decent shelter to South Africa’s low-income sector. In addition, a gap exists between the need for the provision of energy-efficiency measures and other climate-compatible interventions in low-income housing, and the capital available to fund these interventions. As of November 2011, the South African Department of Human Settlement’s low-income housing new build programme aims to provide a subsidy of ZAR 58 820 (approximately EUR 5580 / USD 7120) per top structure built. It is estimated that a further ZAR 15 000 – ZAR 20 000 (EUR 1425 – EUR 1900 / USD 1820 – USD 2420) for improved energy efficiency measures (including thermal performance improvements and solar water heaters) is required per household. This funding gap between standard and improved homes creates an additional financing requirement to support large-scale, climate-compatible housing delivery for the low-income sector in South Africa. It was envisioned by the project team that the concept of the SSF could bridge this financial gap in order to scale up the provision of energy efficiency and climate-compatible interventions in low-income housing. It was anticipated that these interventions will be implemented by the public and private institutions already mandated with housing delivery in South Africa. In addition, the SSF was looking to assess the existing government-subsidized housing structures that required retrofitting in order to improve energy efficiency. Funding for this intervention sought to blend beneficiary contributions, energy efficiency and solar water rebates from national government programmes, carbon markets, climate finance flows (e.g. via NAMA funding, emerging new market mechanisms, etc.) and public finance earmarked for job creation. The South African Department of Trade and Industry’s recent inclusion of energy efficiency requirements in the national building regulations. 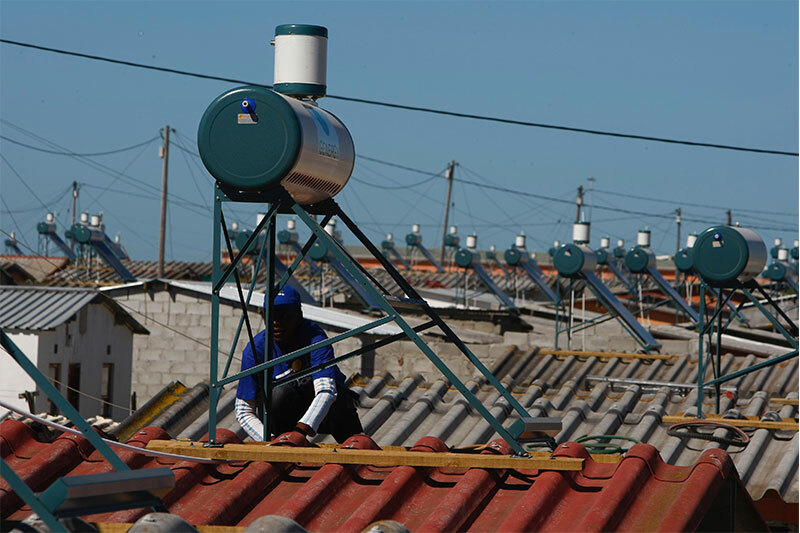 The South African Department of Energy’s One Million Solar Water Heating programme. The Green Accord promotion for the use of clean stoves. The convergence of these government-subsised initiatives and the associated rebates and potential for the generation of carbon credits provides the impetus to integrate national development priorities in housing, energy and job creation with climate change mitigation and adaptation interventions. There are a number of demonstration projects in South Africa where low-income housing delivery have included energy-efficient building adaptations. These interventions are largely funded on a grant basis. Among these demonstration projects is the Kuyasa Clean Development Mechanism (CDM) project. The project was the first Gold Standard and CDM project registered in Africa. 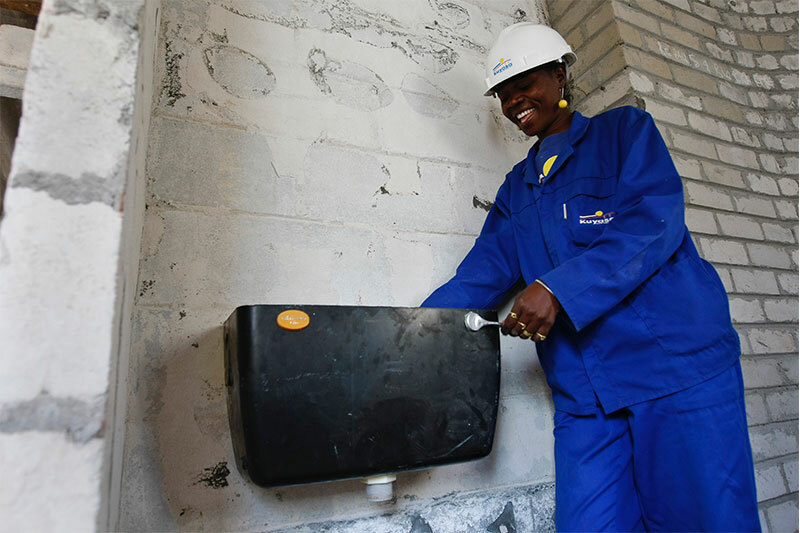 Kuyasa delivered 2309 low-income houses in Khayelitsha with solar water heaters, insulated ceilings and energy efficient lighting, resulting in a saving of approximately 2.85 tonnes of carbon per household per year. Significant social and economic benefits resulted from Kuyasa’s implementation including reduction of negative respiratory health incidences, access to hot water and savings on disposable income (income retention). The project also enabled local job creation during installation and ongoing maintenance of technologies. In this light it was designed to impact not only on the financial and environmental system but also to have an impact on people, jobs and development.